INSOR has published its latest analytical bulletin. The main topics of this issue are: Russian foreign policy in 2012; renewal of the G20 agenda; experts’ thoughts on the regional priorities of East Asia; global governance and the global economy; opportunities and prospects for e-diplomacy. 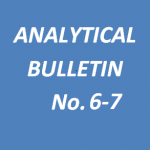 The annotation of Analytical Bulletin Nos. 6-7 can be found below. The full text of the bulletin in Russian can be found here. Russia’s presidency of the G20 began on December 1, 2012. The eighth summit of this informal alliance of the largest economies of the world will be held September 5-6, 2013, in St. Petersburg. “The main objective for the year ahead is to focus the efforts of the G20 on measures to stimulate economic growth and create jobs.” Stimulating investment; trust and transparency on markets; effective governance – these are the overriding priorities of the Russian presidency. The St. Petersburg summit might then serve as a launch pad for the next round of summits, linked by overriding goals, the pursuit of which would gradually provide structure to global governance as the world economy undergoes profound and qualitative transformations. The first regional meeting of the Council of Councils was held in Singapore in late October. Participants of the seminar devoted to “Asia at the Crossroad: Regional Priorities for the Twenty First Century” express some of their theses developed during the course of the seminar. The issues discussed included the development Asian security cooperation, stimulating economic cooperation, overcoming such problems as nuclear proliferation, territorial dispute and instability on the financial system.